There are lots of information that are held confidential. Such examples are records or files of a business firm or a particular person’s life. And yet, this confidential information get exposed by the people without taking such considerations. The thing is, people make it so easier to spread information in an unconstrained conversation with other people without even knowing if such information are proven to be true. One way of getting information is by conducting series of interviews with random people in order to connect or solve the puzzle piece by piece (most especially when solving a cold case or an incident/accident). Formal interviews are used and conducted for various reasons. It could be conducted for interrogation/investigation of a crime or incidents/accidents, a discussion, meeting or conference, etc. 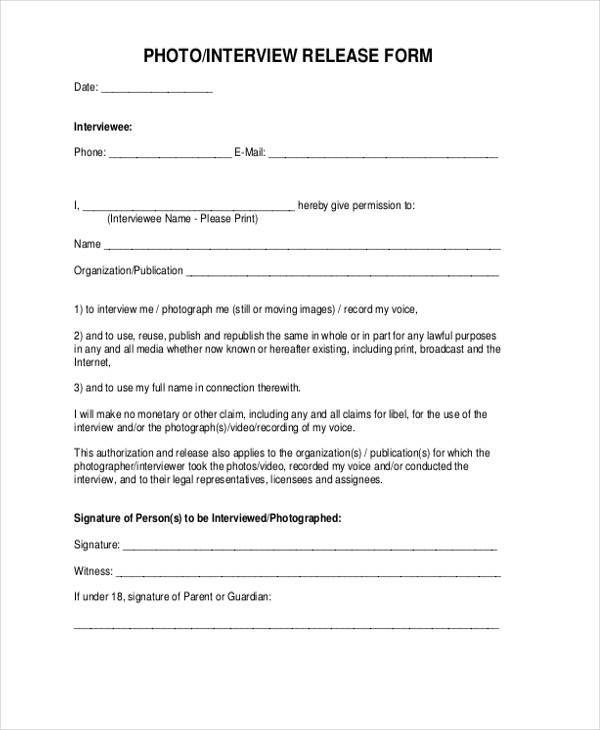 Whatever purpose it serves, a consent and release form from the subject to be interviewed must be secured. What is an Interview Consent Form? In conducting an interview, whether with or without the use of electronic recording/s, it still is important to ask for approval before doing so. The reason for an approval is because you cannot force anyone to speak up want you want to know without their consent. 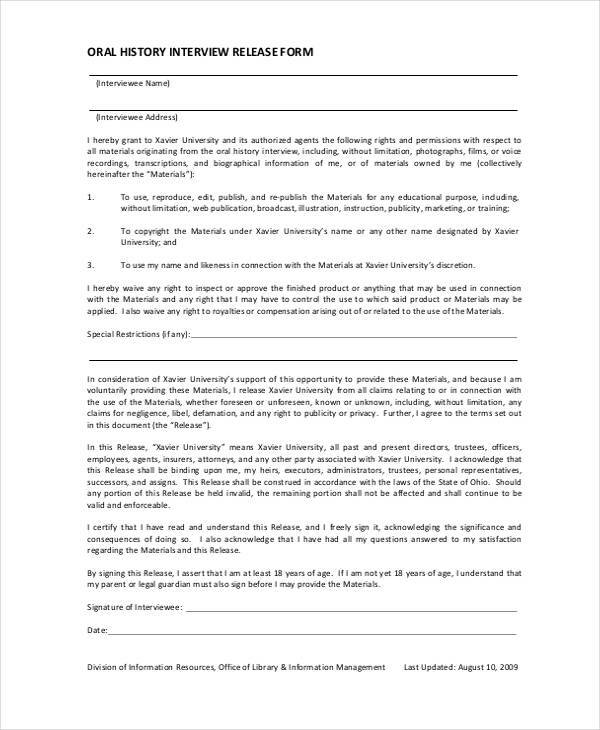 Such consent made is written or documented in an interview consent form. That he/she was given enough explanations and has fully understood the nature of the interview topics. That he/she has fully understood the purpose or the reason why such interview/s is/are conducted. That he/she has been given much time to ask questions and be answered to his or her satisfaction. That he/she grants that his or her statements are to be recorded, either video or audio. 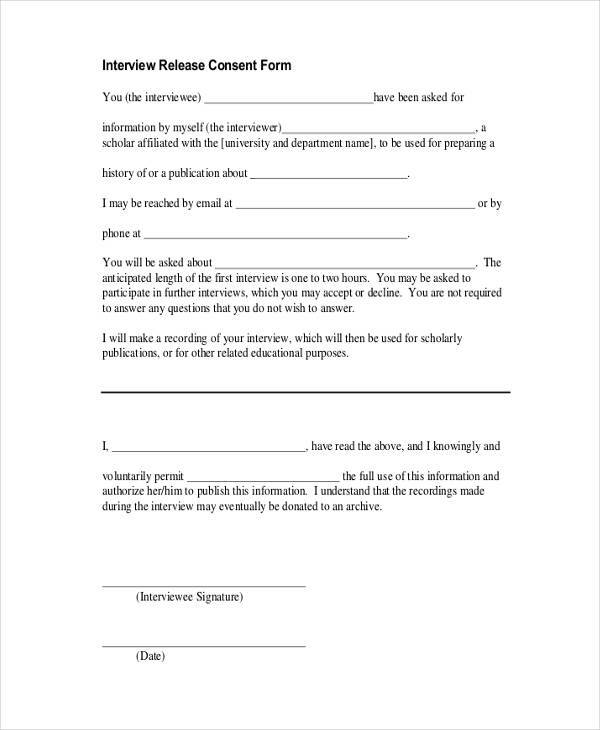 For more examples on how consent forms are written and filled up, see Interview Consent Form Samples. What is an Interview Release Form? 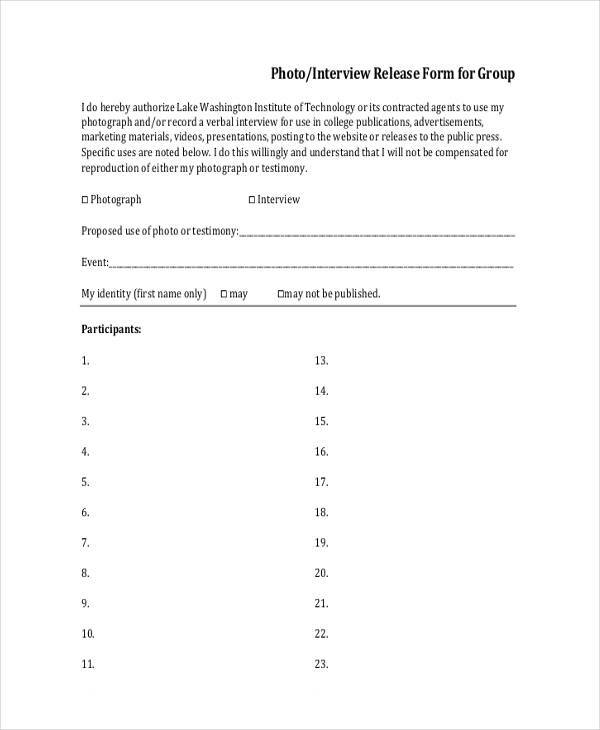 An interview release form is used as a basis that the interviewee has given authorization to the interviewer and all other participants of the research project interview. Such authorization includes the publicity of the information that were collected from him or her. That he/she is releasing all liabilities or any claims that may arise in the future regarding the claims of defamation, infringement of moral rights, invasion of policy, rights to publicity or copyright, etc. Affixing the signatures of both parties certifies that they have fully understood what they are dealing with. 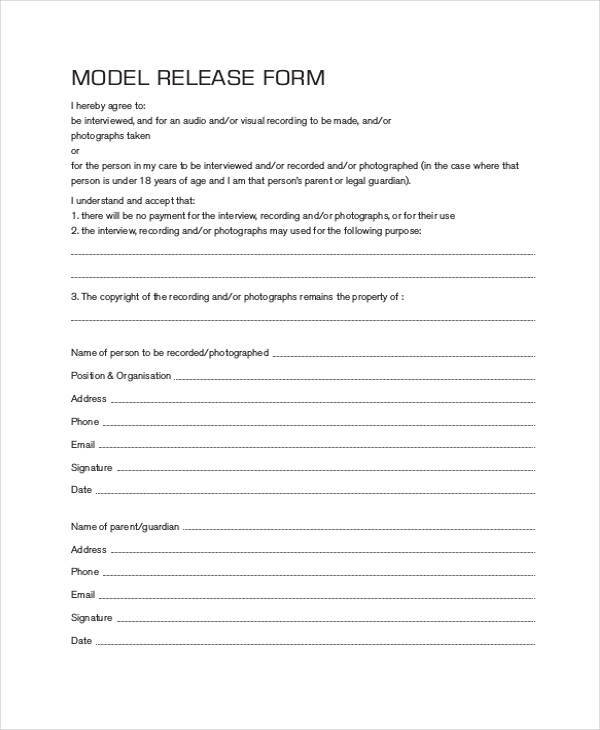 A documentary interview release is documented and is completed using the interview release form for documentary. 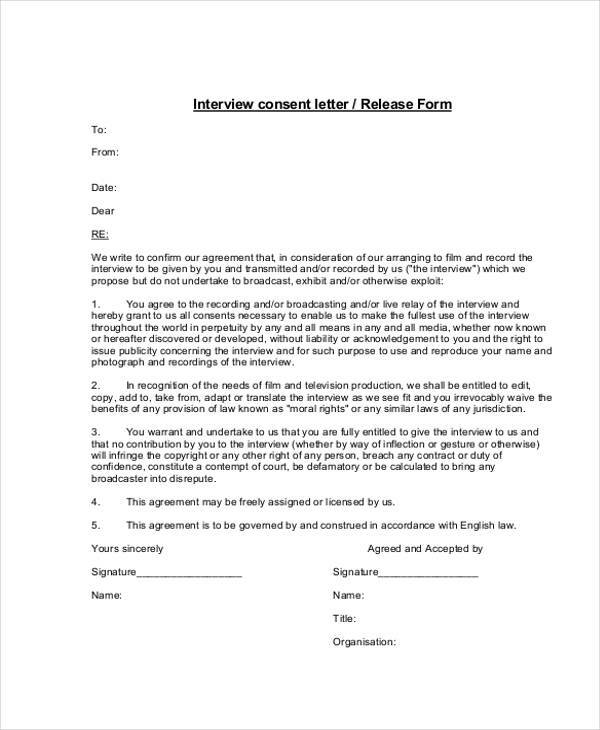 The form serves as an evidence or an approval which is made by the interviewee to grant the interviewer or the filmmaker to use his or her information. The information which includes the statements, images, audios and videos that could be used for the production of a certain documentary. 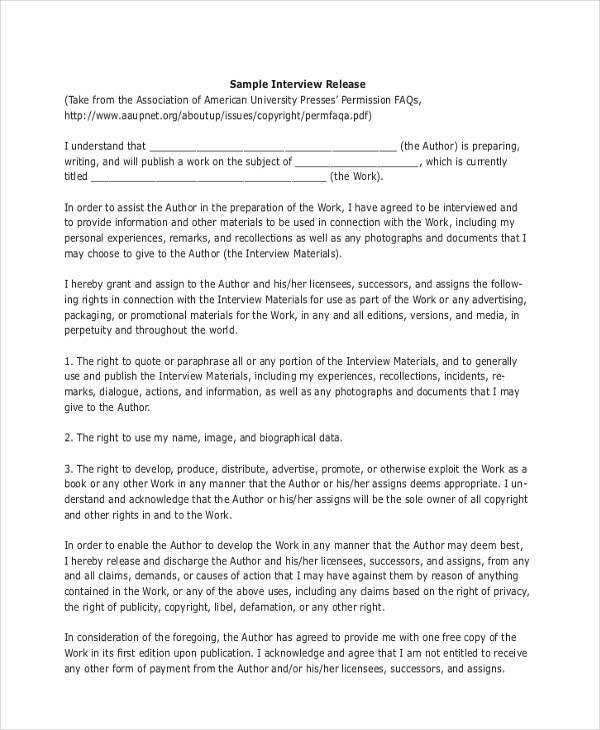 It is stated in the form that these materials or information collected could be modified, changed and published in several copies for however the filmmaker wishes to as long as he or she remains loyal to the truth. 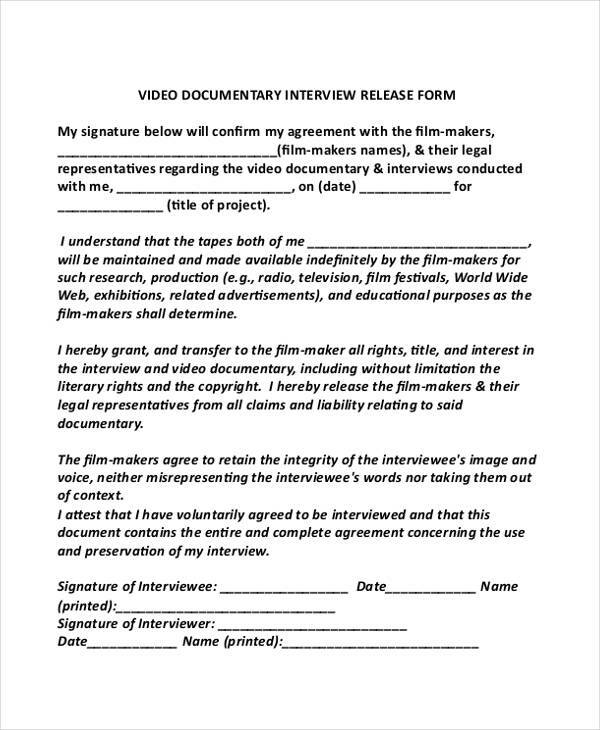 The importance of the interview release form for documentary is that this serves as a proof that the interviewee will not assert any claims to anyone involved with the documentary project. Such liabilities that are waived or release are the civil rights, invasion of privacy, publicity, etc. 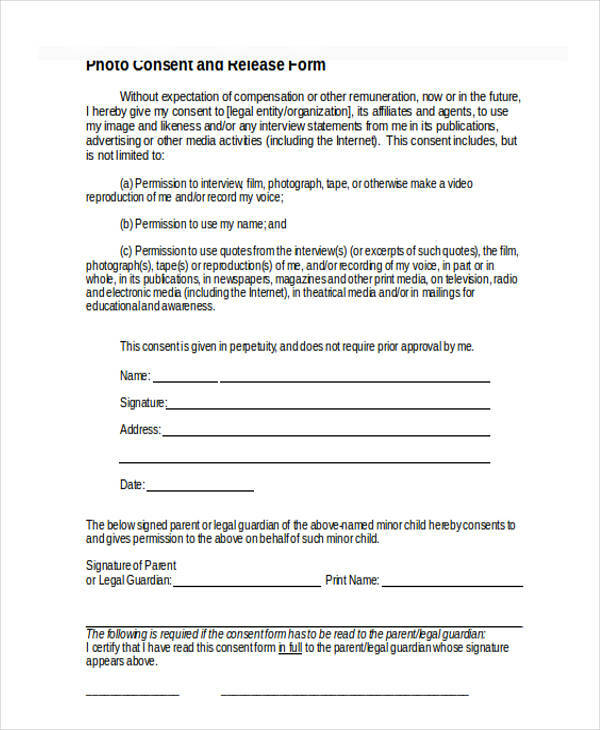 The reason for these to be waived is because the filmmaker is about to film a particular person’s life and fail to obtain a consent and release form will make him be a subject to conviction. 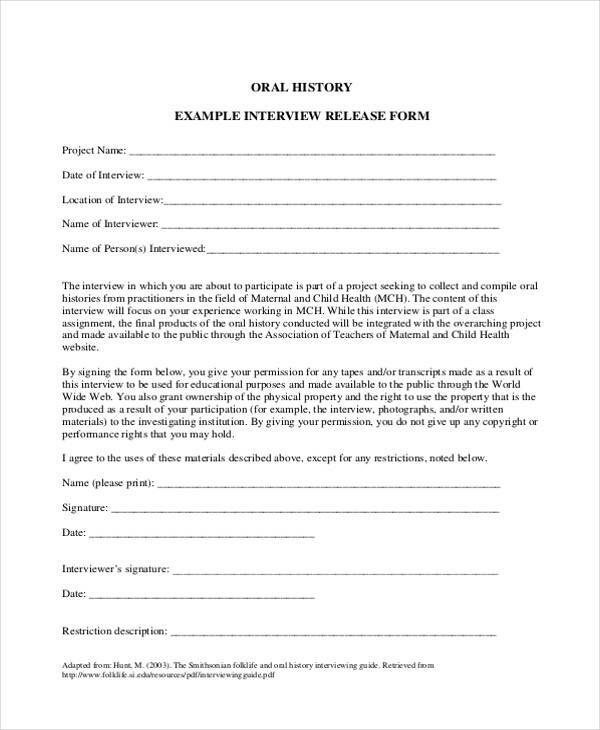 An oral history interview release form contains information that are released from the person who are connected historically or at least have such information regarding the past events. These interview information are basing on the experiences in the form of a testimony of a particular person or group of people. Oral history interviews are conducted for an interviewer to record a specific historical event that requires the interviewee to recall or reminisce. 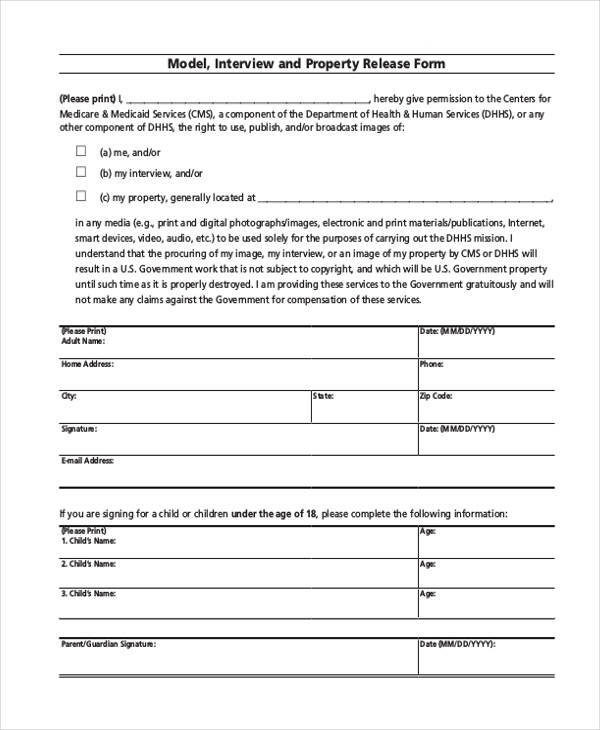 With the interview release form for oral history, it is made sure that the information collected are made public if, and only if the consent of the rightful owner of information is secured. 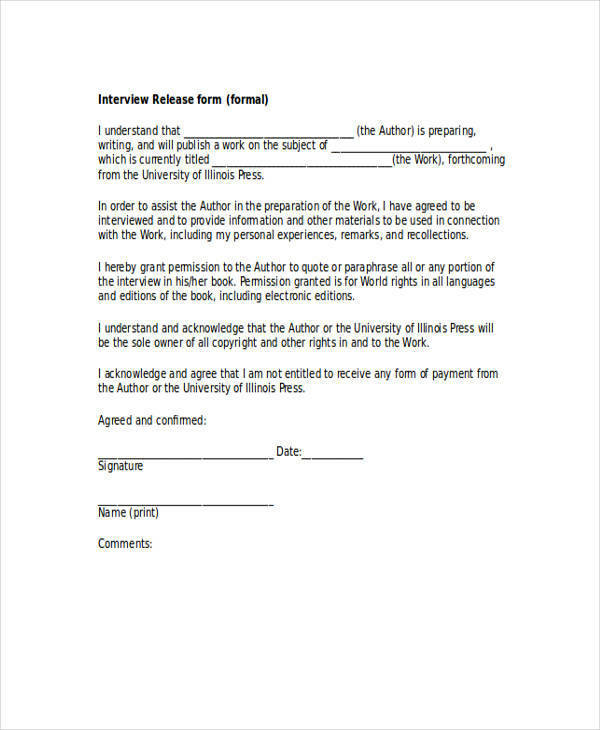 A release form is also used as an authorization that the interviewee gives full control to the interviewer and all other participants on how the information is used and published.